my second batch of food dyed tops are cooking now. i've gone for overkill on the colours, and despite my firm intentions to do 4 different greens i just couldn't bring myself to do it, so we have 3 greens plus a red. i altered some of the colours once the fibre was in and it wasn't looking how i hoped, particularly to deepen the dark green and add blue to the over-yellowy lime. i was quite happy to swish the fibres around in their pots given the cheviot's immunity to felting. i'll also be quite happy if there are variations within the colours, i'm not aiming for solids. in fact i really should think about space-dyeing and steaming in clingfilm for the next batch. update: i think my problem is i'm too much of a perfectionist for this experimental dyeing lark. i'm reasonably happy with the outcome, 3 patchy greens in a variety of shades, though nowhere near as much difference between the colours as i was hoping for. the red's successful in one way - a good rich red, but pretty much solid, no interesting variation, and it's still a little primary for my taste, perhaps one more drop of black might have tempered it a little. now i'm not sure what to do with them. i was planning to do random (small) handfuls then navajo ply, but i'm not sure whether to include the red. i think i might go for 3 skeins - 1 just greens, 1 mostly greens with a little red and 1 mostly red with a little green hopefully that way i can avoid a majorly stripey or muddy brown effect. i guess i could overdye some of the red a little darker. maybe. not that i have so little spirit for adventure, just that i'm very picky about colours. 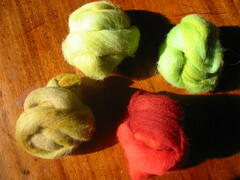 it might actually be more worth my while to buy dyed rovings, especially with more expensive fibres like merino or silk. what's fun at 25p/oz becomes less so when you double that and double it again. update: definitely not happy with the red so i'm partially overdyeing: half the amount water/vinegar so some of the fibre sticks out above it. colour is deep rusty orange: 30y + 5r + 2bk. ditto with the dark green: 30y + 5b + 2bk. i did notice more colour bleeding out when i re-wet the top, so maybe it's worth upping the amount of vinegar in future, sure it can't hurt. update: the red came out more orangey but not significantly darker. i think i'm being fooled by the appearance of the black in the dye bath - it's a lot darker than it turns out in the wool, so i haven't been adding enough. update: i've got 2 colours i'm happy with - the original "leaf green" (which has turned out more limey) and the overdyed dark khaki green which has come out very camo. now i'm more concerned about turning out usable than repeatable colours so i judged the last dye baths by eye. just straight green for the lime, hopefully with the yellow underneath it should make a reasonably strong, clear mid-green. then red + black and dipping half the red (as i do like the orangey red i already have, it's just too much all together) this bath was very dark, so i'll keep a close eye and maybe pull it out half way. final update: pic of the colours now i'm finally happy. nearlyt impossible to get an accurate colour representation.